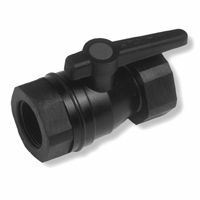 Marelon - Marine Grade Ball Valves are optimized for marine use above and below the waterline with maximum U.V. inhibitors, and it will not support combustion. Additional marine benefits of the material are its extreme range of operating temperature and it's resistance to abrupt changes in temperature. All Marelon valves are non-corrosive, but like any moving part in a marine environment, they required regular inspection and lubrication. Do not fail to actuate the handle and lubricate the seals on a regular schedule (water pump grease or even mineral oil will lubricate seals). I need 2in Ball Valves with NPT female threads on each end. Do you you have these? Marelon ballvalves work well in boat plumbing applications. No need to bond- they don't conduct electricity. Not bothered by sal water. Remember, these ballvalves are not the same as seacocks. Only seacocks should be connected to thru hull fittings.